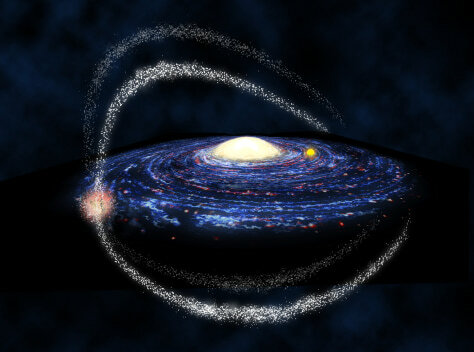 An artist's concept of the four tails of the Sagittarius dwarf galaxy (orange clump on left) orbiting the Milky Way. The bright yellow circle to the right of the Milky Way's center is our sun (not to scale). We can see the Sagittarius galaxy's star tails stretching across the sky.